At the time I happen in, discussion among the core group—twenty or so people sitting cross-legged in a circle—has to do with image. What kind are they presenting? “We should wear khakis,” someone suggests. “Khakis and polo shirts. A suit if you have one. It’s one thing to see hippies in the street—,” a few mutters, “—but it’s better if some businessman can walk by and think, hey, that guy looks like me.” Modest applause. “But that’s the whole point,” someone says, “that we’re not suits. We’re the people. This is what the people look like.” This being sweatshirts, jeans, beanies, hand-rolled cigarettes. More cheering. And a third suggestion: that there’s no need for one uniform, it’s better to have a variety of looks. This gets the most cheering of all. The quiet lasts until a city bus passes and the driver honks, two long beeps—sure, there’s a lot of wiggling fingers, but even more whooping. When the ruckus fades, a man pumps his fist. “She’s in a union!” he says. 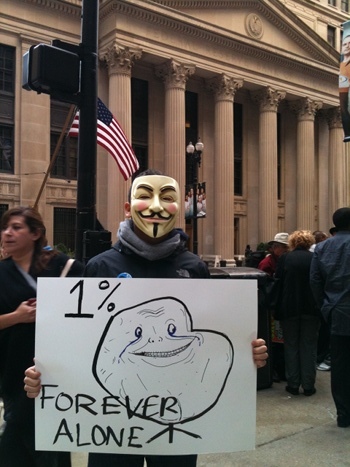 More discussion: The protest now has 5,000 Twitter followers, and its website, occupychi.org, got a record number of hits. $1,100 raised in donations, plus more food than they can eat before it spoils. What they really need are ponchos and socks. Someone’s going to lead a meditation class. Someone else is teaching yoga. Another bus drives by, and everyone cheers even louder than the first time. Nobody cares that it didn’t honk.